What do thousands of kids, makers, poets, artists, steampunks, hipsters, activists, and musicians have in common? They love typewriters the magical, mechanical contraptions that are enjoying a surprising second life in the 21st century, striking a blow for self-reliance, privacy, and coherence against dependency, surveillance, and disintegration. 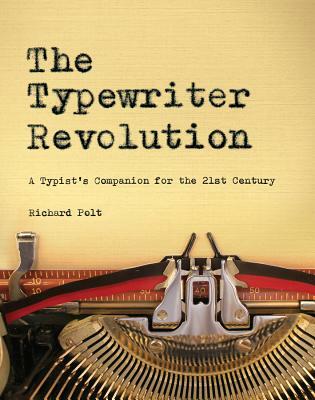 The Typewriter Revolution documents the movement and provides practical advice on how to choose a typewriter, how to care for it, and what to do with it from National Novel Writing Month to letter-writing socials, from type-ins to typewritten blogs, from custom-painted typewriters to typewriter tattoos. It celebrates the unique quality of everything typewriter, fully-illustrated with vintage photographs, postcards, manuals, and more.